The Gulash Programmier Nacht (GPN) took place in Karlsruhe, Germany. The local subsidiary of the Chaos Computer Club organised that event, which apparently took place for the 14th time. So far, I wasn’t able to attend, but this time I made it. It’s a 200 to 300 people event, focussed at hacking, making, and talks around that. It’s very cosy and somewhat similar to the mrmcds. Most of the talks were held in German, a few in English, but I think that could easily change if there is a demand. The conference was keynoted by tante, who talked about the political aspects of code and the responsibility every developer has. It was good to hear someone saying that you do create reality for people with the software you write and that you are indeed responsible for the view on the world the users of your software have. There were a few other interesting thoughts and I think I agree with the results of the analysis conducted to a great extent. But I think a few areas are not well covered. For example, he said that you limit the people with your software. I don’t think that’s necessarily true. If you provide your users with enough freedoms, i.e. by choosing a Free Software license, than I don’t think his argument is valid anymore. On the more funny side, a chemist taught us about chemistry based on the stories of Walter White. It was a funny talk with many interludes of the TV series. She explained what the people in the episodes were doing and how close that is to reality. Turns out, it is quite close and at least stupid mistakes were not done. We also learned about Perl 6. If you think Perl is ugly, he said, it’s not modern Perl. The new and shiny Perl 6 allows you to write short code while looking nice, he said. He showed some features that make it easy to write command line tools. You can simply declare an argument to your main function and Perl would expose that to the user, e.g. by presenting a help screen. It would also detect the types provided and do some magic fancy stuff like checking whether the provided argument is an existing (or empty) file. A very interesting talk was given on the Enigma, the German crypto machine. He showed the machine that broke the crypto and now stands in Bletchley Park. He told stories about the development and operation of that machine. Very interesting indeed. Also well done on a technical level, the slides were really well done. I was invited to give talk on GNOME. As you can see in the video, my battery didn’t even last the full 90 minutes slot I was assigned. Something is certainly wrong, either this Linux thing or my battery. Anyway, the talk itself went very well, and it was particularly well attended for that early slot. I was also positively surprised by the audience asking many questions and while I specifically asked for flames, I didn’t get that many. I was fortunate to be able to attend this year’s GNOME Asia Summit in Beijing, China. It was co-hosted with FUDCon, the Fedora Users and Developers Conference. We had many attendees and the venue provided good facilities to talk about Free Software and the Free Desktop. The venue was the Beihai University somewhat north of Beijing. Being Chinese, the building was massive in size. So we had loads of space, anyway The first day was reserved for trainings and attendees could get their feet wet with thinks like developing a GNOME application. I took part myself and was happy to learn new GNOME APIs. I think the audience was interested and I hope we could inspire a few attendees to create their next application using GNOME technologies. I was invited to keynote the conference. It was my first time to do such a thing and I chose to give a talk that I would expect from a keynote, namely something that leads the conference and gives a vision and ideas about what to discuss during the conference. I talked on GNOME, GNOME 3, and GNOME 3.12. I tried to promote the ideas of GNOME and of Free Software. Unfortunately, I prepared for 60 minutes rather than 45, so I needed to cut off a good chunk of my talk Anyway, I am happy with how it went and especially happy with the fact that I wasn’t preaching to the choir only, as we had e.g. Fedora people in the audience, too. We had RMS explaining Free Software to the audience and I think the people enjoyed his talking. I certainly did, although I think it doesn’t address problems we face nowadays. People have needs, as the discussion with the audience revealed. Apparently, people do want to have the functionality Facebook or Skype offers. I think that addressing these needs with the warning “you must not fall for the convenience trap” is too short sighted. We, the Free Software community, need to find better answers. The event was full of talks and workshops from a diverse range of topics, which is a good thing for this conference. Of course, co-hosting with FUDCon helped that. The event is probably less technical than GUADEC and attendees can learn a lot from listening and talking to other people. I hope we can attract more Asian people to Free Software this way. I am not entirely sure we need to have the same setup as with GUADEC though. With GUADEC, we change the country every year. But Asia is about ten times larger than Europe. In fact, China alone is larger than all of Europe. It makes it somewhat hard for me to justify the moving around. We do need more presence in Asia, so trying to cover as much as possible might be an approach to attract more people. But I think we should investigate other approaches, such as focussing on an annual event in one location to actually create a strong Free Software location in Asia, before moving on. I wouldn’t know how to define “strong” right now, but we have absolutely no measure of success right now, anyway. That makes it a bit frustrating for me to pour money over Asia without actually seeing anything in return. I would like to thank the organisers for having provided a great place us, the Free Software community, to spread the word about the benefits of free computing. 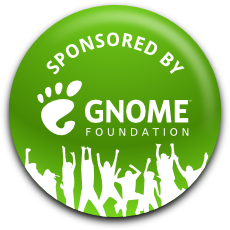 I would also like to thank the GNOME Foundation for enabling people like me to attend the event. I tried to install the most recent OpenSuSE image I received when I attended the OpenSuSE Conference. We were given pendrives with a live image so I was interested how smooth the OpenSuSE installation was, compared to installing Fedora. The test machine is a three to four year old Intel Ideapad s10-3t, which I received from Intel a while ago. It’s certainly not the most powerful machine, but it’s got some dual core CPU, a gigabyte of RAM, and a widescreen touch display. When I was asked about my partitioning scheme I was moderately confused. The window didn’t present any “next” button. I clicked the three only available buttons to no avail until it occurred to me that the machine has a wide screen so the vertical space was not sufficient to display everything. And yeah, after moving the window up, I could proceed. While I was positively surprised to see that it offered full disk encryption, I wasn’t too impressed with the buttons. They were very tiny on the bottom of the screen, barely clickable. Apparently something ate all the memory so that I couldn’t even start a terminal. I guess GNOME’s system requirements are higher than I expected.